Suncare protection has gotten more fun with the launch of Lip Hop, a new line of suncare essentials by Guardian. This range is dermatologically tested and proven by health and beauty expert Guardian to provide all year-round protection and comfort with innovative Korean formulations to simultaneously benefit our skin. 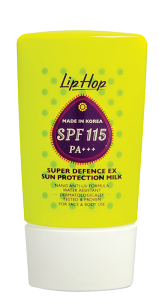 Lip Hop, which is made in Korea to provide quality and innovative products to address suncare needs will cater to every kind of outdoor activity, and tailored for various suncare concerns, the extensive collection offers affordable protection around the clock. Portulaca Oleracea and Apple fruit extracts – to help soothe skin after sun exposure and prevent skin damage from free radicals respectively. I never try this brand before... Is it new in the market?